GIFT CARD 150€ to spend on this e-shop, without time limits. If you're worried about the product you would like to give away could not arrive on time, if you're undecided about the choice, if the recipient has difficult tastes and you prefer him / her to choose, a gift card is what is right for you. Buy the voucher of the amount you prefer with the payment method you prefer, download the file, print it and give it to the person you want to make a special gift for. Take note of the order number and of the date of your purchase on the sheet that you will print: it will be necessary for the person who receive it to redeem their voucher. There are no time limits to redeem a gift card. HOW TO REDEEM A GIFT CARD? Take a look in the shop and choose what you love the most. Keep in mind that, in addition to the price of the item, shipping costs will also be calculated in the final price. 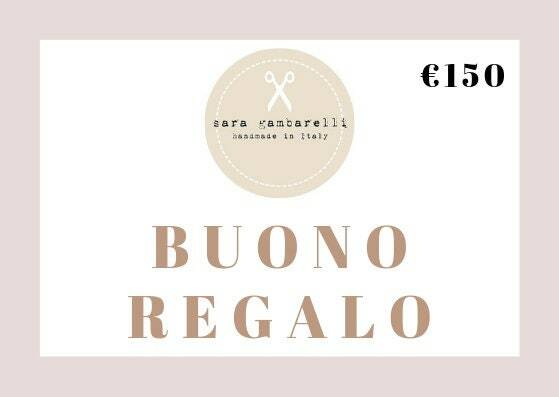 Send me a private message or an email to info [!at] saragambarelli.com telling me the order number, the date of purchase of the voucher and the item you prefer, with size, color and everything necessary to make your unique handmade item. Remember to provide a phone number: it will be necessary to send your package!